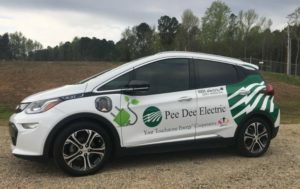 Pee Dee Electric, based in Wadesboro, recently added an electric vehicle to its fleet: a Chevy Bolt – aptly named “EVie” by co-op employees. Pee Dee Electric has installed a ChargePoint home charging station, typical of what members would have in a garage, at its Wadesboro office, in part to plug in and assess the impact of an electric vehicle on the grid and determine the potential need for a time-specific electric vehicle rate. The Bolt is an all-electric, with a driving range of more than 200 miles, (EPA-estimated 238 miles), and is American made.